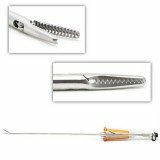 Thoracic graspers feature long, thin shafts ideal for use in minimally invasive procedures with jaws ideal for grasping tissue. If you don't see the thoracic grasper you are looking for, contact us. We can reference any catalog number from any company and can help with even discontinued and hard-to-find patterns.